In 2018 Toro Australia sent some Australian Golf Assistant Superintendents to experience working at the home of Golf and in 2019 we’re doing it all again! If you are an up and coming Australian Golf Assistant Superintendent who would love to intern at one of the world’s most iconic Golf Courses, then here is the opportunity for you. Toro Australia in conjunction with St Andrews Links are giving two people the chance to win the experience of a lifetime! Over a two week period you’ll get to work the Junior Ladies Open and the Boys Open at the start of August at St Andrews Links as well as shadow the Course Managers and spend time with the Learning and Development Officer. Entering is easy. 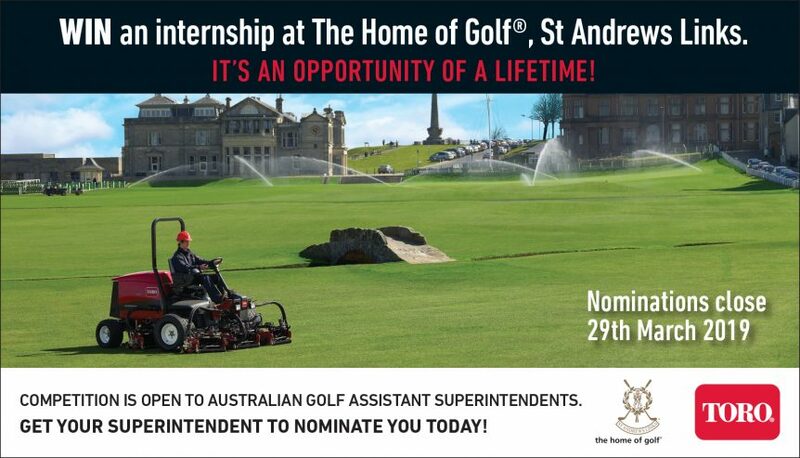 Go to www.toro.com.au/internstandrewslinks, your Superintendent will need to nominate you and describe in 300 words or less why they think you would be the best candidate to intern at “The Home of Golf”. Applications must be received by the 29th of March 2019. Your club will need to approve you being away from the 25th of July to the 9th of August 2019 before applying (including travel time).